MADISON, Wis. — The breakout star of Wisconsin’s overachieving defense joined the Badgers in 2013 as a tight end. He injured his right knee in 2014, his left knee in 2015. He underwent surgery, then rehab, then a position change. Fourteen months after “learning the basic things, like where defensive players put their hands”—his words—he’s one of the Big Ten’s most disruptive linebackers. He humbled Leonard Fournette in Week 1, tormented Michigan State in Week 4 and absorbed double-teams and protection slides against Michigan in Week 5, still finishing with 11 tackles, two for loss, a sack and a quarterback hurry. The ascent of outside linebacker T.J. Watt is a rich tale. And by virtue of being a Watt, it’s a predictable one. He is the last of the Watt brothers to come through Madison. Derek, two years older, is now a fullback on the Chargers. J.J., the eldest, needs no introduction. Entering Saturday’s primetime battle with No. 2 Ohio State, T.J. Watt leads the Big Ten with 5.5 sacks. Two evaluators said that if the 6-foot-5, 243-pound junior enters this year’s draft, he will have, at minimum, a second-round grade. There’s three beats of dead silence. He asserts his seriousness. 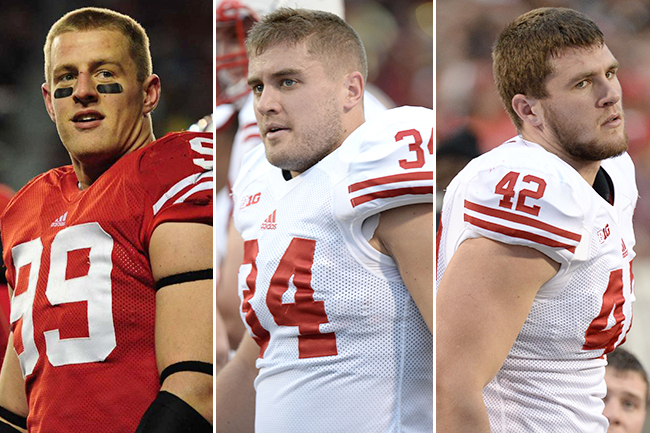 The Watt Brothers at Wisconsin, left to right: J.J., Derek and T.J. In 2014, when T.J. was nursing a knee injury and Derek had a broken foot, Connie and John temporarily moved into an on-campus hotel, chauffeuring their sons to classes. “I think from J.J. they just know how hard it is to get to a certain level,” says T.J., recalling how his older brother was a walk-on at Wisconsin who needed to earn his scholarship, and spent summers driving Pizza Hut delivery. “And they want to make sure we have all the tools. T.J. is close with Derek, but is a clone of J.J. personality-wise. “It’s like we share the same brain,” says T.J., who matches his brother’s obsession with maximization. He spent his one off week this summer crashing at J.J.’s house in Houston. There are other perks to being J.J.’s little bro: T.J.’s knee surgery in 2015 was preformed by Texans team surgeon, Dr. Walter Lowe. The walls of T.J.’s Madison apartment are plastered with motivational quotes. When J.J. underwent back surgery last month, T.J. selected a quote and texted it to him. He has sent one nearly every day since. “People who don’t like inspirational quotes are the people who read them, but don’t actually comprehend them or take them to heart,” says T.J.
That’s not the only thing on the Watt brothers’ text thread. T.J. says he returns to the locker room after a Wisconsin game to sometimes hundreds of messages—Derek and J.J. commenting and critiquing every single play. • THE NFL’S EASTERN ILLINOIS PIPELINE: Shanahan, Romo, Payton, Garoppolo. A look at the small FCS program that was the only alma mater with a starting QB, a head coach and a GM in the NFL when the 2016 season opened. When T.J. returned to practice in July 2015, coach Paul Chryst suggested a switch from tight end to defense—the same move J.J. had made seven years earlier. T.J. queued YouTube clips of pass rushers like Von Miller, Lawrence Taylor and, of course, his brother, and decided to give it a go. He began fall camp in 2015 on a pitch count because of the injury. If the Badgers had two-a-days, Watt could only participate in one portion. In a 24-period practice, he could only go for 16 and needed to spend breaks icing. He hadn’t played a live football game since his senior year of high school in 2013. “Because we had two seniors at his position, we were able to bring him along slowly,” says outside linebackers coach Tim Tibesar. Four games into the year, Watt was folded into third-down pass-rushing packages. “Not shockingly, he has some natural pas rush instincts,” Tibesar says. In some of those situations, Watt was on the interior as a nose guard. “And he showed great football intelligence,” Tibesar says. 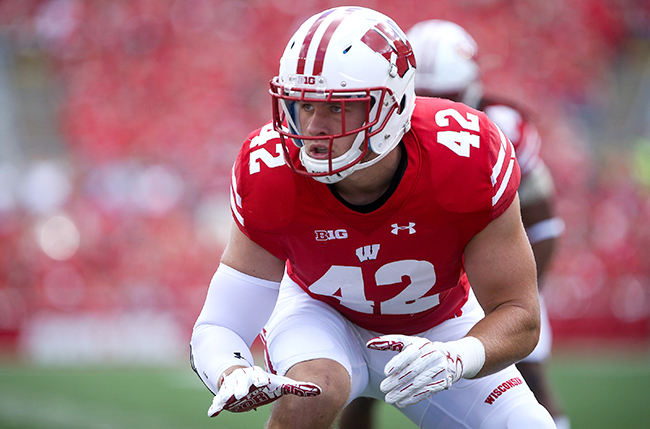 “He could probably pick up any position.” When an injury forced the staff to push outside linebacker backer Jack Cichy inside, Watt inherited regular playing time. Another way T.J.’s life is mirroring J.J.’s: Opponents are now game-planning specifically to stop him. Michigan was the first game that star senior linebacker Vince Biegel missed, and in the first 35 to 40 plays, Watt had zero tackles. “It wasn’t that he was playing poorly,” Tibesar says. “The ball just wasn’t going his way.” Wisconsin adjusted, Watt began to play more freely, and over the next 35 plays he had 10 tackles. Though J.J. socializes with celebrities and becomes selfie-bait anytime he steps out in public, the spotlight is still uncomfortable for T.J., who pulls the brim of his hat low to hide his face while walking across campus. • EVERYTHING LEONARD FOURNETTE DOES… EXCEPT RUN: You already know that Fournette is outstanding as a runner. But what else do scouts want to see from the star tailback? I asked, and then I spent a Saturday watching Fournette do everything else but run. A current NFL player explains why his former collegiate teammate is destined for success as a pro. Here’s Lions defensive tackle A’Shawn Robinson hyping his former teammate at Alabama, Jonathan Allen. • DESHONE KIZER AND THE ND QB FRATERNITY: Former Fighting Irish signal callers weighed in on the pressures of South Bend, and why Kizer might be the one to become Notre Dame’s first great NFL quarterback since Joe Montana. You’re in luck if you live in Ann Arbor and enjoy a good prime rib. The local Ruth’s Chris Steakhouse advertised a promotion before Michigan’s game against Rutgers: If the Wolverines won, customers would receive a percentage discount matching the margin of victory. Luckily (for the manager), the discount was capped 50 percent. Because the Fighting Jim Harbaughs obliterated Big Ten bottom feeder Rutgers, 78-0 on Saturday. The Scarlet Knights didn’t get a first down until the fourth quarter. Michigan out-gained Rutgers 600 to 39. Those are just two of many ridiculous stats I could spew out about Rutgers’ ineptitude, but let’s focus on the positive for Rutgers fans: Spend a nine-hour drive broiling in your own frustrations, and you can get a good steak for pretty cheap. Important promotional update: Tried to get a reservation at the Ann Arbor Ruth's Chris and it's completely booked all week. No. 1 Alabama at No. 9 Tennessee (3 p.m.): The Volunteers are no longer undefeated, but I’m transfixed by Butch Jones’ team; every game features wild theatrics. Tennessee hasn’t defeated Alabama in its last nine tries. The Crimson Tide are cruising as usual, and as I talk to NFL scouts I’m amazed by the depth of top-tier NFL talent on the roster. Keep an eye on stud cornerback Marlon Humphrey, and how he responds to a harsh self-evaluation after last week’s win against Arkansas. No. 12 Ole Miss at No. 22 Arkansas (7 p.m.): Ole Miss is averaging 41.6 points and 333.4 passing yards per game. Quarterback Chad Kelly, nephew of Jim Kelly, is a pure gunslinger who must prove to NFL teams he can make good decisions when taking shots downfield—and in his free time (the latest incident for the senior QB, who was dismissed from Clemson in 2014: jumping into a brawl at his brother’s high school game during his bye week). You bet scouts will be paying close attention to how he responds against a tough Razorbacks team. No. 2 Ohio State at No. 8 Wisconsin (8 p.m.): This very well could be a preview of the Big Ten Championship game. The Buckeyes looked pedestrian against plucky Indiana last week (that’s relative use of “pedestrian,” since they still won by three touchdowns). The Badgers are coming off a bye and facing their third top-10 team in four weeks. Can T.J. Watt and Co. slow down the three-headed rushing monster that is J.T. Barrett, Curtis Samuel and Mike Weber? Pharaoh Brown, TE, Oregon: Finally 100 percent healthy after a gruesome injury. Has improved as an in-line blocker. May still have a shot with his overall athleticism but some off-the-field concerns. 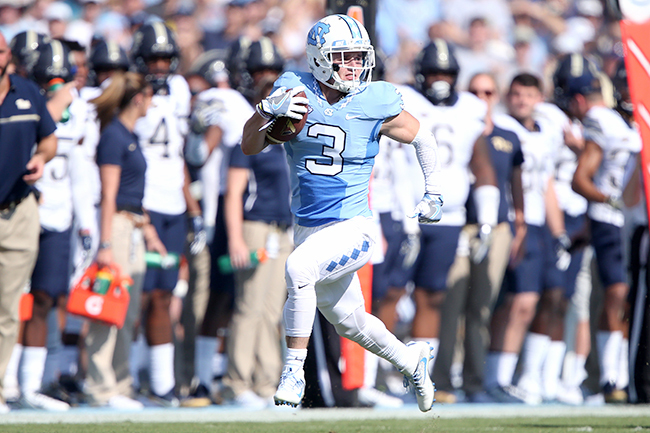 Ryan Switzer, WR, North Carolina: Not the best looking wideout on the team, and smaller than listed [at 5-foot-10], but he does the most. Great all-around player, outstanding punt returner. Not the best catch radius but sticky hands. Cordrea Tankersley, CB, Clemson: Good length, athleticism. Strong ball skills. Like his toughness, rarely gives up on a play. Willing tackler. Evaluation could vary based off scheme. Thought he might come out last year, but glad to have more tape on him… was only a one-year starter. • FROM WESTERN MICHIGAN TO ROUND 1: He nearly missed out on college altogeher, but now record-setting wideout Corey Davis could join Randy Moss as the only MAC receivers ever taken in the NFL draft’s first round. Former NFL GM and current Reese’s Senior Bowl Executive Director Phil Savage highlights senior match-ups he’ll be keeping an eye on this week. Western Kentucky WR Taywan Taylor vs. Middle Tennessee CB Jeremy Cutrer: While most of the nation's attention will focus on Madison or Knoxville this weekend, NFL scouts will be watching this Conference-USA duel between two talented skill players. Taylor (6' 1", 195 pounds) is an outstanding wide receiver for the Hilltoppers who already has 42 receptions in six games, for an average of 16.0 yards per catch and four touchdowns. Last year as a junior, he grabbed 86 passes for 1,467 yards (17.1 avg) and 17 TDs. Cutrer (6' 2", 170 pounds) is a tall, long-armed cornerback with excellent straight-line speed. He has 23 total tackles and has broken up four passes for the Blue Raiders. After his transfer from Mississippi Gulf Coast Community College in 2015, he registered 30 total tackles, defended 13 passes and intercepted three others as a junior. • IN SEARCH OF ‘THE NEXT CARSON WENTZ’: Combing the FCS ranks for the next top QB prospect, the search came across Brady Gustafson, a 6'7" passer from Montana who beat Wentz in his first career start. I drove to Madison last week excited about one Wisconsin export only: Spotted Cow. For the unfamiliar, the New Glarus beer obtained cult status in the Midwest, mostly because it can’t be sold past state lines. Genius marketing. I’m a fan—it’s a crisp, easy-drinking cream ale—but non-Sconnies treat it like liquid gold. Gas stations right over the border have signs plastered at the door listing the various bottle sizes and case sizes of Spotted Cow they carry. So yeah, I have a case in my fridge right now. But the trip wouldn’t be complete without everyone’s other favorite Wisconsin delicacy: cheese curds. Admittedly, I’m not a huge cheese person. Like, I’ll have some provolone on my sandwich but I don’t fiend for chunks of cheddar. Everyone in Wisconsin seems to fall under the latter category, so cheese curds are a staple on almost every menu. Along with my travel partner, Joan Niesen of Campus Rush, we shared two orders of cheese curds in two days. The first were at Dotty Dumpling's Dowry, which is a dark and homey bar downtown. Their curds—to my unrefined palette–were like mini balls of mozzarella sticks and a nice complement to burgers. The next day we went for the high-brow version at Graze, a farm-to-table, locally-sourced restaurant with wall-to-ceiling windows overlooking the capitol. These curds were vodka-battered and were almost tempura-like with hot gooey cheddar swimming in the middle. And with that, I officially met my cheese curd quota for 2016.